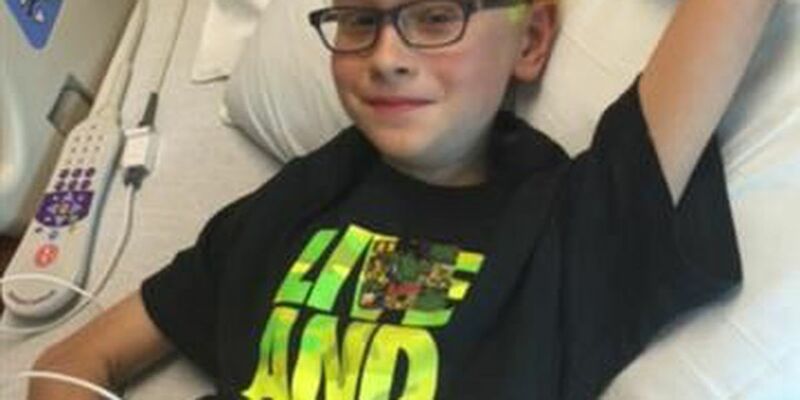 CHARLOTTE, NC (WBTV) - I hate to give this update: 10-year-old Elijah Aschbrenner's cancer is back. His mom says they found out on Easter Sunday. He began radiation Friday morning. Elijah was one of my Facebook "September Kids" last year. You can see the post from September 2 here. Elijah lives with his mom in Concord, but is also often with his dad in Statesville. His cancer journey began almost a year ago when he was diagnosed with Epithelioid Sarcoma. Only 500 cases in the United States have been found since 1970. Elijah is one of the youngest to have it and one of the only to get it in his neck. Late last September he underwent a successful surgery to remove the tumor. Things had been going well. Last week, however, surgeons noticed a few spots of disease when they had a camera inside Elijah's chest to remove pockets of fluid. His mom, Becky, says the cancer returned in the lining of his chest wall, in the lower part of his right lung. It's not IN the lung, but outside, which makes it more challenging to pick out and kill. Becky Aschbrenner says the radiation he just started is strong. "As you can imagine, we are devastated," she said. "Our hearts are broken. But we are also ready to fight." Don't you think Elijah looks like a fighter in this picture? Confident and comfortable. Again, he's only 10. Becky says the entire family is pulling together for support, leaning on each other and making sure Elijah and his brother Sam have the most updated information and an open line of communication to ask any questions and express any emotion. Sometimes these updates shoot way too hard to our hearts, whether we personally know the child or not. It's one reason I love something Elijah's dad, Matt, said last September. We were talking over the phone and he said it in passing, but I've never forgotten its simplicity. Seems fitting to relay it now. "Hug and kiss your kids," he said. "Even if they're grown up and say 'ewwwwww' while you're doing it. Do it every chance you get." You can read more about Elijah on his often-updated Facebook page here.